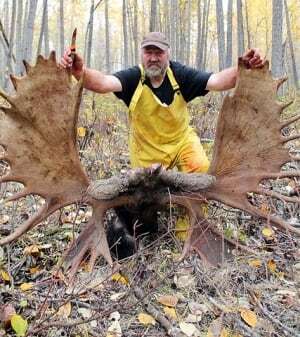 Giant Yukon moose confirmed as world record !! The rack on the moose shot by a Yukon hunter last fall has now been verified as a world record. The moose shot by hunter Naef Heinz in Yukon last fall has been confirmed as a world record. Last month Heinz Naef of Dawson City and his fellow hunters had to travel more than 10,000 kilometres to Reno, Nev., to have the rack verified. At the time the moose was harvested, the rack measured 191 centimetres. The moose itself was estimated to weigh 560 kilograms. The rack had an official point score of 263 1/8. The previous record was 261 5/8. it caused quite a stir at the border in Montana, Naef says. "There was one border guard and he immediately went on the radio and said 'Come on guys, you've got to see this. You'll never see anything like this again.' All of a sudden there were 15 or 20 officers standing around just in awe." Though there has been a lot of interest in purchasing the record rack, Naef says he isn't sure yet what he will do with it. Re: Giant Yukon moose confirmed as world record !! Geesus that was a big moose. it would have been interesting to see how big the rack would have gotten had the moose not been murdered . There goes another alpha male breeder. I think there should be an open season on trophy hunters. Well Cry Me a River it was taken legally and they ate it all except the hooves and horns WTF else do you want? It's already passed it's genes on many times. Naef carried a .303 British with open sights and 180-grain Winchester ammunition. The hunter stalked to within 35 yards of the big moose before taking the shot. Gotta love the .303 Enfield. 3/4 million dead Nazis can't be wrong. Hope it wasn't just killed for the rack. I've seen deer with just a steak cut out of a hind quarter, makes me sick. At least he was a hunter, used a good ol' 303, didn't shoot it out a helicopter with an assault rifle . Ah, sh|t. Just the rack is a record. I brought down a moose east and north of Kamloops that weighed 740+ lbs dressed (gutted and skinned)and would have been about 1500 lbs (670 kg)on the hoof. The rack was pretty big but not a record at the time. Yeah, not a fan of people that go for size after that big bull I got. My moose was pretty much only good for burger and sausage. I like young moose and deer now and feel sorry for the idiotic trophy hunters.
" Heinz says he hunts for meat and has no interest in the antlers, so if they turn out to be a world record size, Naef would like to see them displayed in public." Uhuh. Notice his pic where he's displaying his rack? It screams out, "Look what I got"! Displayed in public along with a little plaque that says he got the moose and it has a record rack. My rack's bigger than your rack! Na na na na na na na na! 740 lbs of burger and sausage would keep me over the winter. I really like moose, don't see them around here too much anymore, might be global warming. You haven't lived until you've tasted moose pepperoni, for sure. Yeah, and it's gotta be Duhbama's and Harpy's fault. Damn Muslim terrorists anyways.